We spent more time on the road last week then we sometimes do in an entire month. 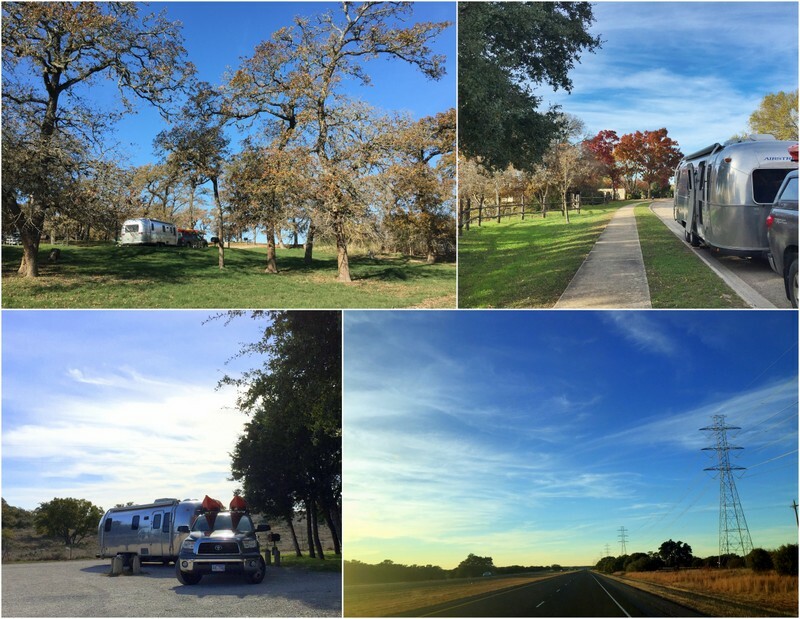 From Monday to Saturday we drove a whopping 998 miles all the way from our lovely site in east Texas to Benson, Arizona. Along the way we spent two nights at an ACOE campground called Yegua Creek, one night at a Walmart in Kerrville, one night at the Caverns of Sonora, and one night at the Camping World just north of El Paso. On Saturday afternoon we drove into Arizona with the goal of making it to the SKP Saguaro Co-op in Benson. A few miles from our exit dark clouds rolled in and snow started coming down. 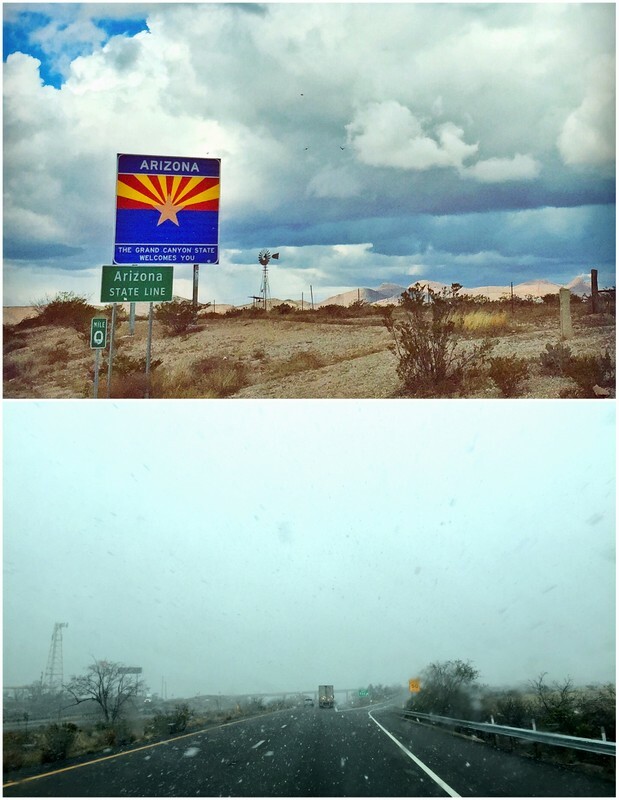 Ummm…welcome to Arizona? Despite the weird weather, we’re happy to officially be back in the southwest after spending the last year traveling around the eastern side of the county. Even though it’s been too cold to get out and explore, it still feels good to be back in the desert. 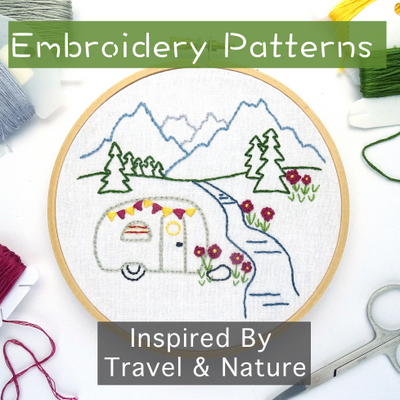 Our primary goal this week is to have a ton of packages delivered, take advantage of our full hook-ups to do a thorough Airstream cleaning, and complete some projects around the house to ready ourselves for a few months of bondooking. More on all of that later though, because right now I want to tell you about a really awesome cave that we toured on the way through Texas. 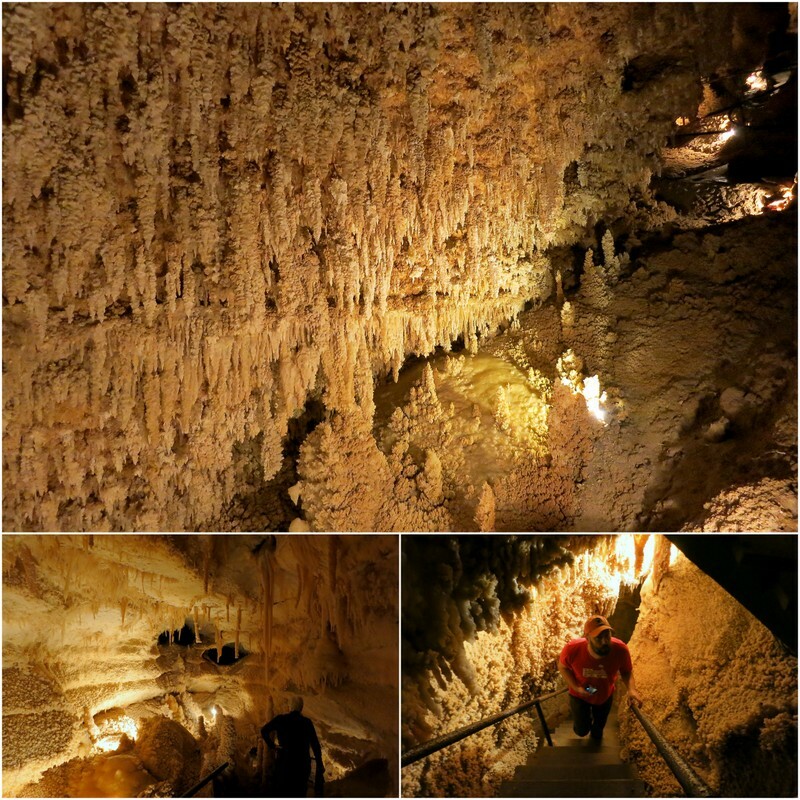 The Caverns of Sonora were first put on our radar by a blog reader who mentioned this privately owned cave in the comments section of our post on Mammoth Cave (thanks Kyle). Located only a few miles off a particularly dull section of I-10 between Kerrville and Fort Stockton, this cave proved to be a great way to break up what would have otherwise been a very long and boring drive. They also have an onsite campground that consists of a gravel parking lot with basic sites offering electric and water hook-ups for $20 per night. Even if you don’t tour the cave, it’s probably the best place in the area for a cheap overnight on this section of I-10. Although, if you do stay there and don’t see the cave you are definitely missing out. Our tour guide was a young guy names Jose who clearly had a passion for this cave even though he’d only been working there for about a month. For someone with no previous cave knowledge he shared a lot of great info with us, and most of all he was very personable and made us feel like we were all on an amazing adventure together. One of the great things about this tour is that it’s limited to 12 people (ours only had 8) which provides an intimate experience that you just can’t get with a larger group. 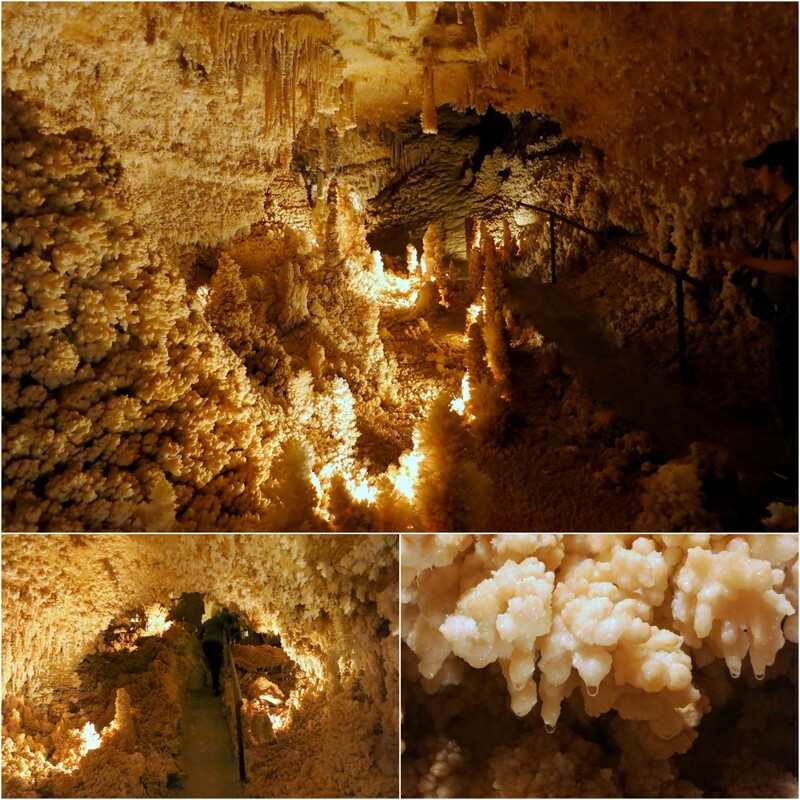 In addition to stalactites, stalagmites, cave bacon, soda straws, popcorn, and a few impossibly narrow passageways that the original explorers used, Jose also pointed out several spots in the cave where formations had been damaged due to vandalism. It’s hard to believe that anyone would have the audacity to deface these ancient formations, but sadly it has happened a number of times in this cave (before they made the tour groups smaller). The worst case of vandalism occurred on a particularly delicate formation called the butterfly. This extremely rare helicite formed a perfect butterfly until some a-hole broke off a piece of its wing in 2006. He was eventually caught after bragging about it on Facebook, but unfortunately at the time this kind of vandalism was only a misdemeanor. 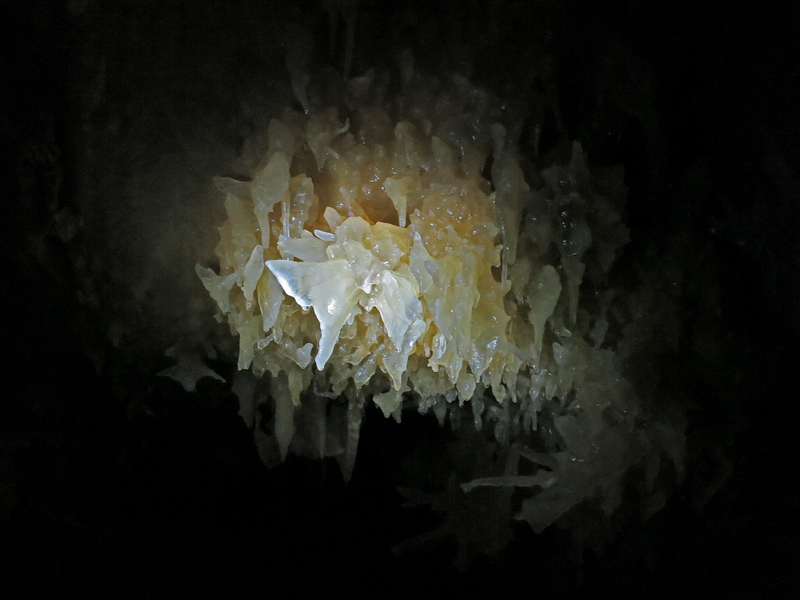 Since then defacing a cave in Texas has become a state felony subject to a hefty fine, but that doesn’t do anything to repair this invaluable formation. If you want to see what it looked like in its perfect state check out discovertexasonline.com. 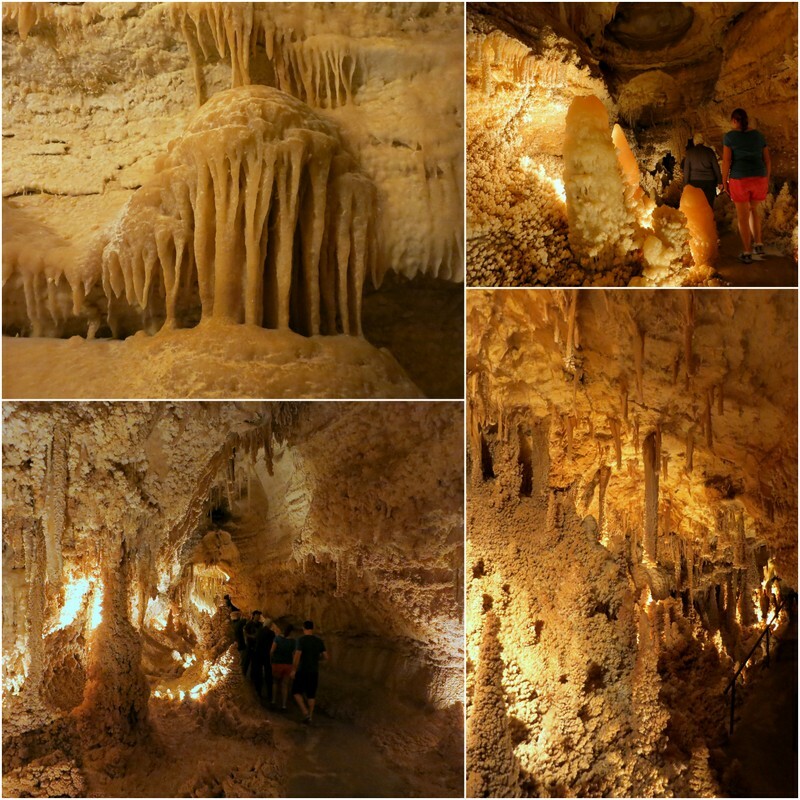 Despite the evidence of vandalism, this cave remains an incredible place to visit and I would highly recommend it to anyone traveling through Texas on I-10. The basic tour lasts about 2 hours and costs $20. There are some stairs and slick inclines, but provided you wear proper shoes (not flip flops) and use the handrails, this tour should be easy for most anyone. 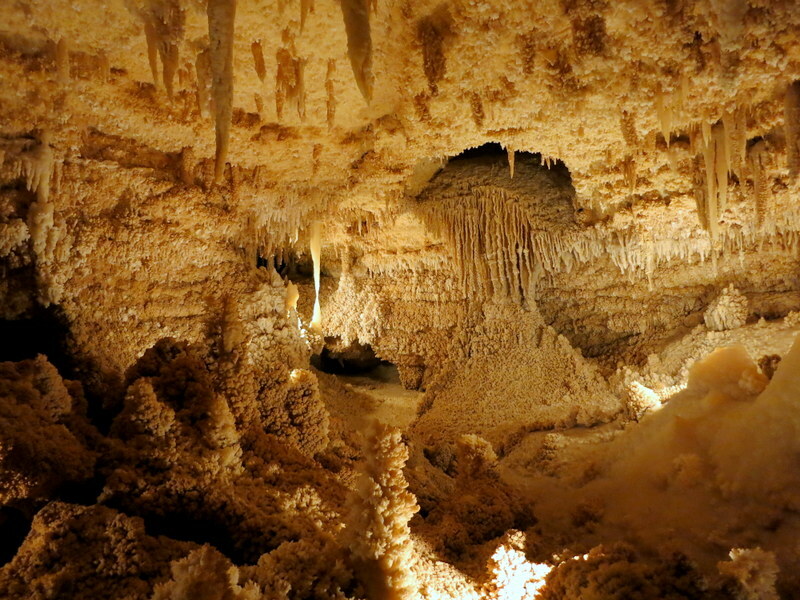 The cave has a year round temperature of 72 degrees and 98% humidity. The high humidity makes it feel very warm. Wear a t-shirt! You can’t bring anything into the cave expect your camera — no water bottles and no bags. Some of the passageways are narrow with formations close on either side so any sort of bag could cause potential damage. While the pace of the tour was slow enough that we all got to take as many photos as we wanted, if you’re really into photography it might be worth it to book the Photography Tour where you can bring along a tripod to get the best shots. And if you’re really adventurous, check out the Discovery Challenge Tour which includes off trail passageways and a 50 foot rappel into the Devil’s Pit. Thank you for letting us know about these caves. Lovely pictures. Definite stopping point when we next travel I-10 in TX. You’re very welcome. It was a really great stop that broke up a long drive on I-10. Glad y’all enjoyed the caverns. They’ve long been one of my favorites. Thanks again for mentioning them. I can’t believe this magical place is not more well known! Wow! Better than Carlsbad? That’s really saying something. We’ve traded places with you now. We’ll be on the east coast for the next couple of years. Boy is it wet here! I still love Carlsbad for its size and grandeur, but this was a much more intimate experience with some truly dazzling formations. Have fun in the east. That humidity can be terrible to get used to! WOW! I can see why this is your number one cave! Just gorgeous! That quite a week of travel but I can understand why you’d want to blast through and get it over with. Welcome back to the West! 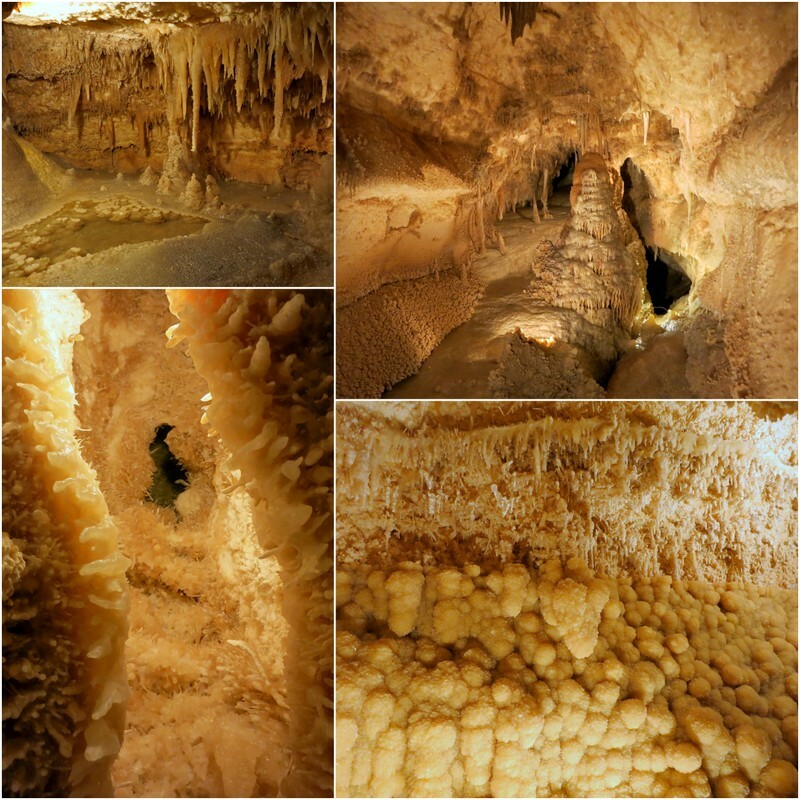 Thanks for sharing the photos and info on the cave. I’m going to be out that way this spring and will definitely put it on my list of things to do. A definite stop if you’re traveling through the area! Beautiful, I will try and remember that one when we get in that area. Thanks for sharing. You’re welcome. I love sharing amazing finds like this! That is so totally cool! We had no idea about this cave, and we find ourselves traveling through Texas a lot on our way back and forth to Florida. Thanks for the great tips! Your photos are terrific. I’m bummed about the butterfly but it still looks beautiful in your photo. 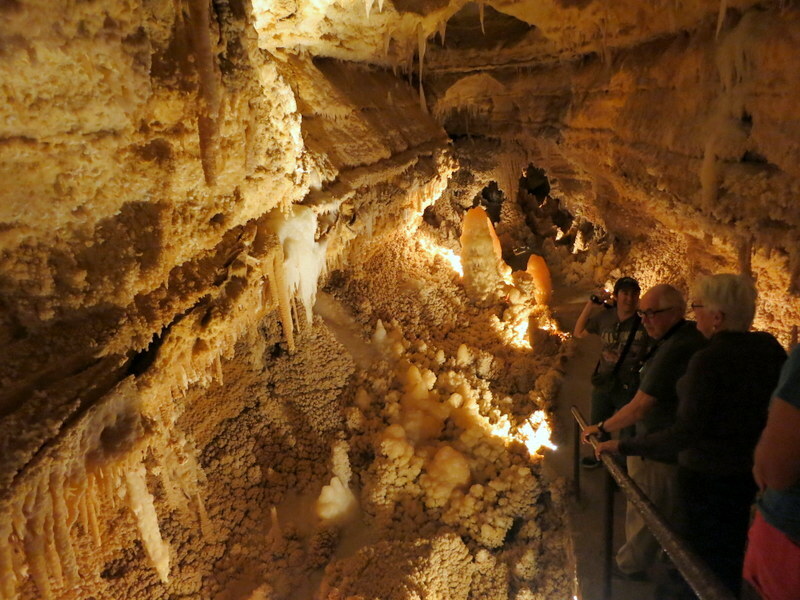 I just found your blog while searching full time RVing and was delighted to see you enjoy Sonora Caverns. 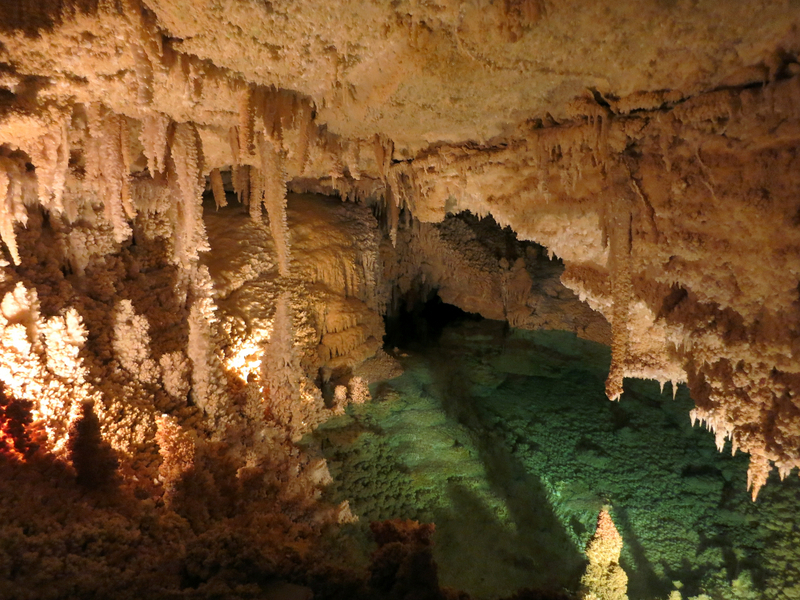 I grew up just north of there and the caverns have always had a special place in my life, I think it’s the loveliest caverns (and I’ve been to lots from TN to NM). Love your blogs and pictures! Safe travels! 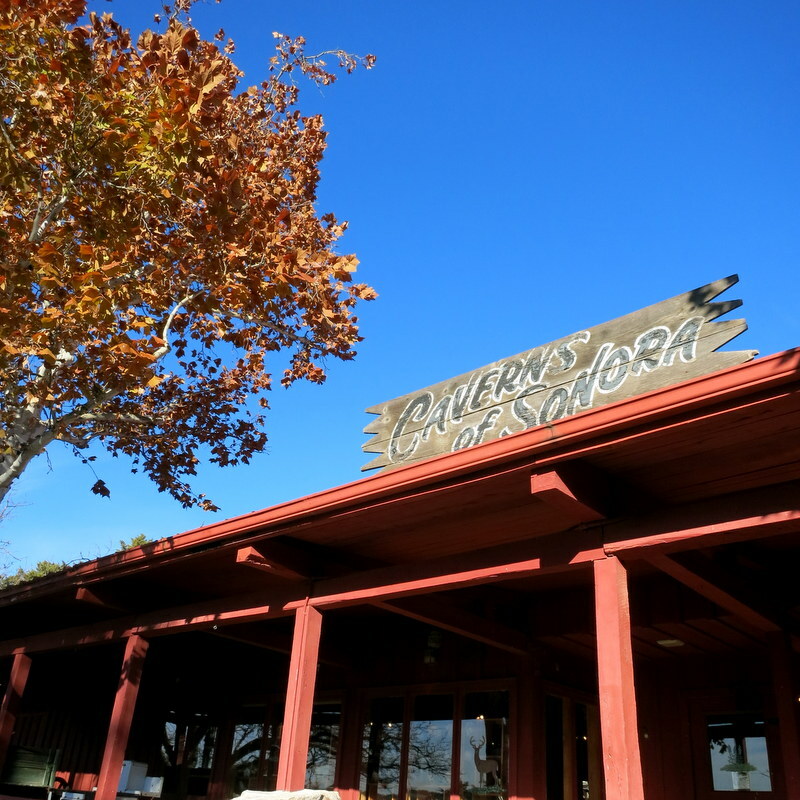 We’ve been to several other caves since this time and agree that the Sonora Caverns are simply the best!